WUWT has another post by Jim Goodridge. It makes one question whether that blog has any standards for truth or accuracy. Golly. Jim Goodridge was wrong. This, ladies and gentlemen, is the quality of “science” you can expect from the WUWT blog. I’m surprised you did not also tackle his comments about SST and CO2, which are at least as egregious. I wonder how he reconciles the fact that CO2 levels never rose above ~285 ppmv in the MWP with the rapid rise today, and the supposedly equally warm, or warmer MWP (according to fake skeptics). As a rule of thumb, I never trust anyone that talks about graphs but don’t show them. Indeed, I usually don’t trust people that just don’t show graphs. I wonder, is Jim Goodridge “hiding the decline” in sunspot number? It is more important for him to write it out as a Haiku than to present a coherent, scientific argument. As an artsie, I must point out that it’s no more Haiku than coherent. Perhaps “inhaikuherent” is the term you are looking for? Fixed it a bit more. I would say that I can describe exactly what the standards for truth and accuracy are at WUWT, to at least 3 significant figures. All of which happen to be one below unity, but there you go. “Whether” that blog has any standards for truth or accuracy? Tamino’s politeness may be misunderstood here. It even looks like he’s still trying to firgure this out. Their degree of accuracy is obvious: whatever denies the need for action is welcome. Now, now, Tamino, Pielke Sr. has assured us, assured us I say, that Anthony is devoted to the highest robustness of science! Well, to cherry pick a line from Goodridge’s article, “…as skepticism survives it is not about facts – but about cause”. Is he actually saying that the agenda is more important than the truth? OK I do know the climate scientists have a good handle on the solar effects. And this may not mean anything but spot numbers seem to have increased in the thirties which coincide with improvements with telescopes. I think k values are supposed to take care of that but just wondering. Never mind fixed, I thought that the answer to that question had been made clear years ago. I remember seeing tamino use the term “bag of hammers” in one of his previous posts about WUWT, and frankly, I found the term a bit inappropriate — because unlike Watts and his followers, hammers are *useful* tools. Perhaps “bag of hammer-heads” (ie, no handles) would be better. Actually, my Brazilian buddy, Tom, acquainted me with a Brazilian colloquialism that I have adopted: mala sem avalanca–a suitcase without a handle. It’s really perfect for summarizing the sort of annoying person who is almost impossible to handle gracefully. I should know better than to go over there first thing in the morning. The display of ignorance killed the buzz I had from watching the eclipse. …..WUWT’s “standard for truth or accuracy” has of course always been lamentably low. And arguably there has always been an expectation of further decline, as climate research and AGW consequences accumulate. I must disavow my subjective seat-of-the-pants feeling that I noticed this decline, over my few years of intermittent attention. My perception is colored by this expectation. …..It’s an easy prediction that future academic historians will be perusing these same WUWT blogposts (as barometer and/or cause) more objectively, looking for explanations of the initial delay in reducing CO2 emissions. And they too will be grateful for tamino’s efforts to demonstrate where WUWT went wrong. Unfortunatly, since the goal of WUWT is the “initial delay”, they have apparently succeeded, and future academics will likely study WUWT for successful propaganda techniques. “The idea of the blog is to learn, discuss, and enjoy … topics on religion, discussions of barycentrism, astrology, chemtrails, 911 Truthers, HAARP, UFO’s, and mysticism” – no joke! [Response: You have quote-mined this, completely out of context. Clearly the policy page states that such topics are forbidden. As Al points out below, layzej reads like a “false flag” comment, an attempt to post lies about WUWT in hopes that others will take the bait, and then be used to discredit the climate realist community. There is a layzej at slashdot who seems to be a climate realist – I suppose this “layzej” here could be a spoof meant to discredit the original as well. Possibiity B is that layzej decided what’s an acceptable strategy for the Romney campaign is good for everyone else to do. That would be a mistake, but it’s interesting that a comment to a blog post is being held to a higher ethical standard than the campaign for the likely Republican nominee. FWIW Jim Goodridge is a very old, and not entirely lucid, man. I’ve met him repeatedly over the years on social occasions. If he did any work as a California State Climatologist or even as a consultant it was some years ago. If he has any peer-reviewed papers published in the last twenty years I would be shocked. The fact that he ignores current literature published in the best journals renders his opinions moot. Claiming the credentials of the scientific academies while ignoring current, peer-reviewed findings is dishonest in the extreme. The ramblings of senile old men are just that. Anthony Watts is here in town with me and Jim and for him to publish Jim’s work, knowing Jim’s condition, without vetting it is also dishonest. layzej’s comment is less likely to be a pathetic attempt at a joke, than subterfuge. I suspect it’s a blatant attempt to have a false comment sitting in place on this site without refutation for long enough to be able to point to it from certain sites of a “different persuasion” as undeniable proof of the to-be-demonstrated “scandalous disregard for truth and accuracy shown by climate scientists and their cronies”, if you get my drift. It’s a good thing you checked it at time of publication. Fascinating. You have to be on your guard, don’t you! Like the constitutions of the U.S.S.R. and other one-party tyranies, the stated goals and standards of WUWT are quite innocuous. But their actual practice regularly strays far outside the bounds of reason and evidence. Anyone can easily reproduce Tamino’s graphs at Wood for Trees. Why would anyone lie about something so easy to check? Did anyone get Pangolin’s “joke”? I didn’t. Sorry, I meant layzej, not Pangolin. Not entirely true – one needs a deep, even anticipatory grasp of the precepts of complex causality. 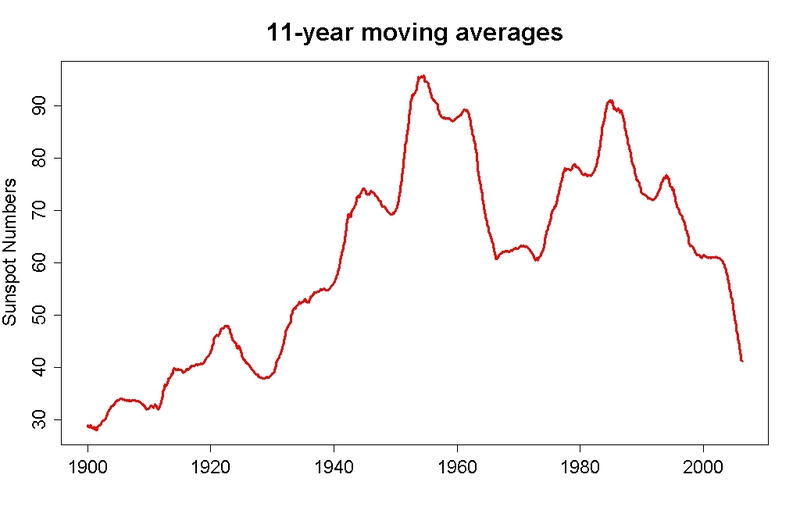 But indeed the recent warming is a result of coming rises in SSN through the next solar cycle. see my comment http://www.realclimate.org/?comments_popup=669#comment-120172. It’s not inconceivable that (via some as yet unknown mechanism or aetherial link) the presence of a quantity of warm brine at the astronomically insignificant distance of 93M miles may make an iron-cored, medium star nervous enough to break out in spots. There are of course several assumptions yet to be …um .. ironed out. I can imagine how that line would be misinterpreted if it was in a leaked email sent by scientists. Pangolin, Google Scholar for JD Goodridge shows nothing since 1996, and his last few papers were a) the UHI effect explains trends for California, and b) (with Christie) the satellite record shows cooling, so surface temperature trends are probably UHI. Since both of those explanations have been long-disproved, but were still somewhat plausible in the early 90’s (although waning in the face of actual physical evidence of warming and physical explanations why warming was expected), this seems to be a case where he’s moved from ‘no warming’ to ‘it isn’t us!’. He’s moving, at about .07 the rate of the overall community. In another 15 years, he may accept that human-produced CO2 has a role. From the charity report link Anna Hayes provided above. Off topic – GWPF (I forget what it stands for. Silly me. Is it Great Wads of Petroleum Funding?) It is wrong to say that “Its main purpose is to advance the public understanding of global warming” although the mistake is a simple one to make. In their principles they state “Our main focus is to analyse global warming policies and their economic and other implications. Our aim is to provide the most robust and reliable economic analysis and advice.” the principles being followed by a rider “Above all we seek to inform the media, politicians and the public, in a newsworthy way, on the subject in general and on the misinformation to which they are all too frequently being subjected at the present time.” Presumably “the subject” they inform on is global warming policies. I say there is an easy mistake to make because the GWPF (I still cannot remember what that stands for. Gentlemen Who Prefer Fantasy?) make the mistake all the time, reporting on the science (on which they have no view) all the time with scant regard for any policy reports whatever. What amazes me is that anyone listens to them.. I have just being commenting on this article on the WUWT site and found a re-direction to this site, which I haven’t seen before. On the WUWT site the commentators had a wide range of views, some informed, most not informed. On this site, however, all the commentators agree. There seems to be no debate nor dissenting views. Why is that? They can’t all be sycophants. This site may be a little more tightly constrained than some others (either by the host or commentators), but I think that many of us are grateful that there is a threshold for rational thought here.Tamino has dedicated some posts to discussing thoughtful posts and challenges. There are places where Wattsian ideas can roam freely, where challenges to climate science that are mutually incompatible can be raised without anyone batting an eyelash; this isn’t one of them. There is a difference between advancing a science and advancing a cause. Science is like that. Some things are so clearly demonstrated that dissent is a sign of ignorance. The debate is about things that are still unclear (nd there’s a lot of that in climate science, as there is in any science). RealClimate is the same way, for the most part. Same for evolutionary biology, nuclear physics, etc., even though wishful thinkers and those unconstrained by facts may wish differently. If you’re new to the topic, consider some of the resources under links at top. If you’re not new, and seeking a refuge from silliness, welcome. And look around – there are a lot of things that are debatable, and being debated. You’re thinking that there are two sides to climate science, Bomber, each with opposing opinions. But science is not like that; it’s based on facts, which are either right or wrong — there’s rarely any half-way house with room for debate. Tamino’s article should make sense to everyone who reads it because, as Tamino says, 2+2=4; and on this particular topic there’s no opportunity for alternative interpretation. Yes, this is the point at issue. Is the AGW hypothesis like 2+2=4? Or more likely, some well established law of physics? Or is it like the heart disease – cholesterol hypothesis? If its like a law in physics, then no informed good faith dissent is possible. The evidence is totally convincing, and you either accept it or you are wrong. Why you are wrong – well, it could be simple misunderstanding, lack of information or intelligence, or it could be bad faith denial because you don’t like the idea. AGW is not like this. Its much more like medical hypotheses which are plausible, have quite a lot of persuasive evidence to support them, but which also have other evidence against, and where there is a lot of evidence and observation which does not seem to fit in properly. What usually happens in science in these cases is that the field advances, the original hypothesis is heavily modified, sometimes discredited and replaced. We are not going to find that CO2 has no warming effect. We may find that it is not as great as thought, we may find that the warming is not catastrophic. We may even find that lowering the levels of CO2 will not have the anticipated effect of moderating temperatures. In short, the science is not settled yet. We are still in the phase of discovery and hypothesis and modification. Talking about it being like 2+2=4 just shows an inability to think clearly about the different sorts of scientific knowledge. Horsepuckey. Doing science means going with the preponderance of the evidence–and the overwhelming preponderance of the evidence says that if we keep spewing CO2 into the atmosphere, we are in trouble. Ferchrissake, this isn’t fricking epidemiology. This is physics. CO2 warms the fricking planet. Nearly all the evidence suggests that the amount by which it warms the planet is around 3 degrees per doubling–and if that is wrong, its more likely on the high side than on the low side of that amount. So, maybe, just maybe, instead of lecturing us on scientific method based on your third-grader understanding thereof, you might profit more by actually looking at some of the evidence and maybe asking some questions when you don’t understand. That’s about what the IPCC says. Now, we all (including “the scientists”) distrust a blatant appeal to authority, but extraordinary claims require extraordinary justification. A cherry picked graph (even if it is not from a dubious source) demonstrating a correlation does not come close to cutting it. “Statistics” was a tough subject for most of us. “Statistics” is at the interface between weather and climate. Tamino works hard to bring statistics to level of those of us who did not look foreword to statistics class. . Often he livens up this inherently dull (for many of us) subject by using illustrations of statistical abuse, and Watts’ is a very fertile source for examples. If Anthony wants to talk about the weather today in Chico I would likely believe him, but not any conclusion he would imply from it. Bomber… I would suggest to you that the difference here at Tamino’s place is that the posts are written by a high level statistician, i.e., someone who knows what the f- they’re talking about. We come here to learn and discuss, as one might do in a college course. By contrast, those going to WUWT are presented with posts written mostly by complete hacks, i.e., people who have no f-ing idea what they’re talking about (this Goodridge post is an excellent example). People go there to attack and criticize established science, as one might do in a musty old pub with a bar tender that has a bad attitude. WUWT does have a particularly ‘liberal’ comment policy. Which in some ways is [fooilsh?] admirable. But also ensures that it fills up with utter muppetry, creating a muppetry feedback until a muppetry tipping point is reached and perpetual, run-away muppetry is the result. Censorship is abhorrent, but providing a forum where discussion can happen without being swamped in muppetry is not. In fact, it’s quite important that it can happen. It’s a thin grey line – yet most grown ups seem able to navigate it quite well. Except for those over at WUWT – but the ineffectual comment policy which prides itself on it’s lack of moderation really doesn’t help anyone who might try. When it comes to forum moderation, there are sins of omission as well as sins of commission. The other thing… If I ran a blog about a subject that’s in the public eye and actually relatively easy to find credible information about (yes, the likes of Nasa & the umpteen National Science Academies are credible sources) and very nearly all the comments on my blog were weapons grade lunacy, spectacularly ill-informed bile and willfully in 110% opposition to any credible positions, I think I’d have to wonder if my blog was any good. I’d probably feel compelled to try and post some bloggies that were maybe, I dunno, informative or factual or something. Anthony seems only too keen to encourage ever more muppetry and then ratchet the muppetry up to the next level with his actual blog posts. In short, if you’re a muppet or you want muppetry – there’s a special home for you over at WUWT. It’s a blog by muppets, about muppets, for muppets and encouraging you too to be a muppet. 1. Those who toe the WUWT line are allowed to make the most outrageous claims and also use pseudonyms with impunity. This includes guest posters. 2. Those in any way critical are censored or banned, and often “outed”. The closest I’ve seen to an open blog is Deltoid, where even bad language is allowed. I hate to offer anything construable as a defense of Goodridge’s ‘analysis’ but I think it’s obvious at a glance that the best fit linear trendlines using least squares for both of those data sets would have a positive slope. It’s mind boggling that anyone would consider that a significant fact but it think it makes it arguable that “Results in a graph showing an increasing sunspot trend for 110-years” isn’t actually wrong so much as right but nevertheless an incredibly stupid thing to say. 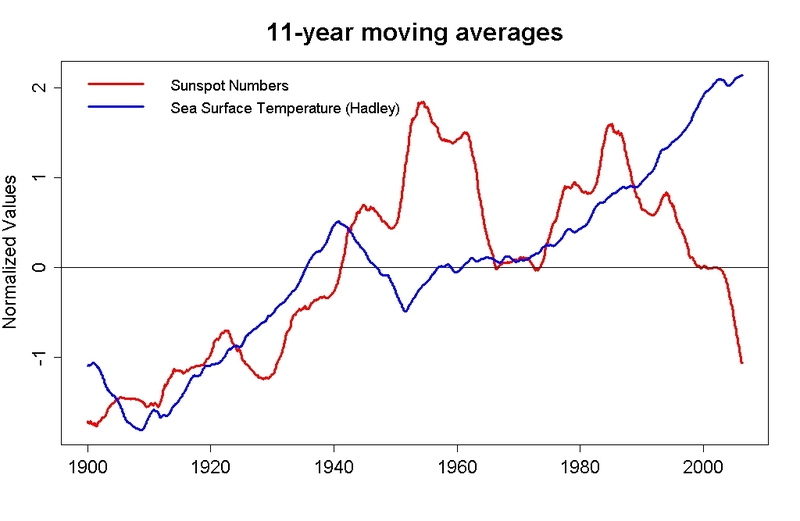 Furthermore, “The trends in sea surface temperature and sunspot trends are similar” is true in somewhat the same sense that 1 and 5,000,000 are similar since they’re both positive integers. Well, given that we’ve known that CO2 is a greenhouse gas since the 1850s and that burning fossil fuels would raise the planet’s temperature since 1896, a lack of debate on these points is no more to be expected than a debate regarding the physicality of the luminiferous aether. I welcome Tamino’s attempts to make Open Mind a zone more or less free of sort of weapons-grade stupidity we find at WTFUWT. Exposure to such stupidity is not edifying. It is not educational. It does not enrich my life or my understanding. OTOH, here I can actually learn something. *Dunning and Kruger also understood, though they did not write a song. Not to mention the liberties they took. What else I do know is that they ain’t true. A hoax for sure as the truth is blue. ‘cause I dunno what it is. I would be interested in your take on the work done and conclusions made at the below link. I believe this person to be an “amateur skeptic” and fully understand if you do not wish to waste your time on it. Perhaps others can weigh in. B Buckner, I have come to think of Tisdale as one of the denialists with the least understanding of how science actually works. In this post, he doesn’t disappoint. He’s using the wrong metrics (e.g. ensemble mean) the wrong methods and the wrong interpretation (dip and rebound). He seems to think of equilibrium for the climate as a sort of stable state, into which the climate will re-settle after a perturbation. This is utter BS. Equilibrium exists because energy out equal energy in. Period. Change either and the climate will head toward a new equilibrium point. There is nothing special about any of the equilibrium points. They are not stable or metastable. As Barton might say, it is crap of the purest ray serene. “The failure of the models to hindcast the early rise in global surface temperatures also illustrates that global surface temperatures are capable of varying without natural and anthropogenic forcings. Run that by me again? Temperatures are capable of varying without any forcings at all? I’m reminded of an old song by Blondie – Fade Away and Radiate …. This is immediately followed by one of the lengthiest and most unintelligible sentences I’ve seen in awhile. I’ve fallen asleep twice trying to read it in its entirety. I’m waiting for the Cliff Notes version. Yes, the goal of most of these folks is to increase doubt, not comprehension. Kevin, I suspect the reason you can’t understand this as written is that you keep tripping over a subconscious expectation that it should actually make sense. Tisdale is a classic example of “worse than wrong”–so muddled, vague and incoherent that his meaning cannot even be discerned sufficiently to say that he is incorrect. Worst of all, he seems to view his lack of clarity as an advantage. …and what one really needs to “understand” folks like Tisdale is the “Off-the-Cliff Notes”. Ray, his lack of clarity IS an advantage, for his intended aim–FUD. As usual, it’s hard to say to what degree he’s self-deceiving, but it doesn’t really matter. One way or another, his behavior is self-reinforcing, and he’ll stay at it for as long as a forum exists somewhere. Kevin, I get the feeling that Tisdale likes to hold court and play the wise old engineer. That means he has to track down an audience less intelligent than him, but that gives him at least most of the left side of the IQ curve. I can’t say much about Tisdale, myself–haven’t read that much–but if you’re right, then I think he’s not the only one for whom that’s part of the allure. After all, if you are going to prop up your ego with delusions of intellectual superiority, why not make your comparisons with the best? Hence my sometime interlocuter–to whom I’ve referred on this forum before–who is also–in his own mind at least–a ‘wise old engineer.’ He apparently believes himself to be smarter than climate scientists (except Christy, Spencer and G & T), quantum physicists, AIDS researchers, and astrophysicists, and has never made a mistake in his life. I have my doubts. You’d really think an engineer would show some elementary number sense, not to mention some sense of physical logic. But then, I’m fallible. Ah, you should have posted my comment without a simultaneous reply. It would have been interesting to see if anyone dare respond without a lead. I have looked at comments on the other articles. They tend to start with ‘Excellent work’, ‘Fine analysis’, ‘Once again, a clear exposition of some interesting work’, ‘Well done’ etc. What do think of that? It’s rather like being in the old Soviet Union, where I spent some time. I have always subscribed to the theory that one word of criticism is worth 1000 of flattery. Climate science is in its infancy. There are lots of uncertainties. No one should seriously doubt that. So, would you like some criticism ? Is it allowed? [Response: Don’t tell me how to handle comments on my own blog. Why don’t you offer some criticism on the content of the post then? Or shall we conclude that you agree with it completely, in which case your complaint about the lack of dissent in the comments rings a bit hollow? Anthony does indeed tolerate fools better than Tamino does. Waddaya make of that? Bomber – I went to WUWT, and looked at your comments. You do seem to understand something about the science, in particular spectroscopy. Which makes your comments here quite odd. Climate science is far from infancy, and the only reasons we’re still arguing about the broad strokes of the science are ideological/political/financial motives on the part of those claiming ‘skepticism’. This is very much like the old arguments about tobacco, and claims that it doesn’t cause cancer – that the science is not settled – etc etc. Pure junk, driven by finances and ideology. It has been my observation that Tamino spends a lot of time, and has a lot of relevant expertise, in time-series analysis. And – very little patience for nonsense. If you read the comments on this blog you will see people who ask questions about statistical significance, about data support, about relevance. Those are criticisms, whether you view them that way or not, and from what I’ve seen Tamino makes an honest effort to answer those. At the end of the line, however, it’s Tamino’s blog. If he wants to limit posts from arm-wavers, from the uninformed, and from the ideologically driven – that’s his call. “Dared” respond? If that is supposed to be some sort of insult, to either Tamino or the commenters here, you have come to the wrong place. *The ones that call themselves “sceptical” wouldn’t know true scepticism if it hit them in the face. Using your own criterion, it’s instructive that you liken WUWT, CA, The Air Vent, and JoNova to the old Soviet Union. Bomber: Climate science is in its infancy. BPL: Aristotle divided the world into torrid, temperature and frigid zones by latitude before 300 BC. Torricelli invented the barometer and discovered the lapse rate in the 1600s. Edmund Halley worked out the basics of the atmosphere’s general circulation in 1745. In 1824, Fourier found that sunlight wasn’t enough to keep Earth’s surface from being frozen. In 1858 Tyndall discovered that water vapor and carbon dioxide were the chief greenhouse gases in Earth’s atmosphere. And in 1896, the later Nobel-prize-winning physical chemist Svante Arrhenius first proposed the theory of Anthropogenic Global Warming. Bomber, Climate science is older than electromagnetism, older than statistical mechanics, older than any well though out idea of entropy, older than Darwin’s Origin of Species and one whole helluva lot older and deeper than any understanding you might have of science. For one thing you seem to be utterly ignorant of what uncertainties mean in science. Here’s a hint–real scientists don’t assume all of them will stack up in their favor. 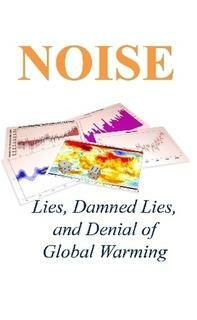 Especially if it includes the claim that AGW is the <a href="“greatest scientific scandal of all time”. Piltdown, eat your heart out! The is a lag between sun spot activity and Sea Surface T. Expect a bit of cooling real soon. In fact, from empirical evidence right outside my window, It’s already cooling at a rapid rate. I always like looking folks like Goodridge up to see where they’re coming from and what they’re about. Hey, if they’re going to make sweeping statements about climate on a public forum then we should know a little bit about them, right? Goodridge is a retired “California State Climatologist.” Not sure when he retired but the reports that I was able to find which he wrote are all on rainfall and all written back in the 1970’s. I can’t find any published research from him in any scientific journals. It looks like he’s done some good work in reconstructing rainfall records starting back in the 1950’s. The sense I get is that, 1) It’s a stretch to call him a climatologist as we understand climatology today, 2) He’s commenting WAY outside of any expertise he has, and 3) He’s gotten WAY behind the curve on this issue. This is not someone who is keeping up with the literature. He’s not someone who has fully informed himself on the broad aspects of climate change. That he’s been given cart blanche to make any kind of comment he wants on climate change by WUWT only serves to drive Watts’ reputation further down the tubes. OK, this is way off topic, but I didn’t get any response when I commented on the open thread. I used AIC to assess whether a quadratic or linear model better fits sea ice decline. Not surprisingly, the AIC of the quadratic linear model is much lower. Based on this, I predict an ice-free arctic in 2043 +/- 2 years. I suspect that this is actually conservative–as the ice continues to shrink, surface to volume will increase, and melting will likely accelerate. Ray, OT but, AIC means? Dividing (2) by (1) gives averaged sea ice depth. For all the Arctic sea ice to vanish all three, volume, area, and depth must approaach zero at the same time. So far all that I’ve been able to do is use a power law (for average depth), and even there, it’s only good for a very flat R^2 relationship (meaning I can get about the same R^2 for 5 or 10 or 20 or 30 years to closure (ice free conditions)). This is all curve fitting mind you. Something using SAT/SST and cumulative degree days, IMHO, would at least try to include some physical mechanism for decreasing Arctic sea ice versus time. Also, IMHO, PIOMAS even though it’s “new and improved” is still underestimating volume somewhat, particularly for the 2010 and 2011 September minimum volumes. Ray, I’m presuming that you used extent as your metric? Extrapolating volume generally gives a much earlier date–in line, for instance, with Maslowski’s 2016, +/- 3. What I did was try two generalized linear models. In model 1, the expected value (mean) decreased linearly with time, and the measured value varied according to a gaussian (with standard deviation to be determined by the fit) about that mean. In model 2, the mean followed a quadratic, again with standard deviation to be determined by the fit. The result was that the linear model didn’t fit the data particularly well–as evidenced by the high AIC value and high standard deviation. The quadratic was much better (~20 better in AIC and significantly smaller std. deviation). It is also interesting that if you use OLS, you get an ice-free Arctic in 2031, while if you allow for gaussian variations about an expected value, you get 2o43. Yes, volume would probably give you an earlier date. However, I have doubts about Maslowski’s prediction of an ice-free arctic in 5 years. I should try my method with volume data. Do you know what data Maslowski used? Not sure what algorithm Excel uses to find the bestfit. That is one reason why I prefer to write my own. I was using MLE with the standard deviation as a variable. This gives me both the minimization of variance and likelihood/AIC as checks. I don’t, Ray. But my understanding is that it was based on some sort of regional-scale physical model, not a statistical analysis. I’ll see what I can find, though. The results were presented at AGU. Ah. Here’s the original abstract. It reveals that he used upward-looking sonar data to determine ice thickness–hey, he works at the Naval Postgraduate School, after all, so if anyone can get the submarine data, he should be able to. seems to have what you want. This is 2001 Excel for Mac; it might have moved since then. Tamino, calm down; take more water with it. It always distresses me when free speech is denied. From my experience, that is the one sin against science and humanity. Free speech is often valuable. Cheap speech never is. Ooh! Me like. I am so stealing the distinction between free speech and cheap speech. I pinched it from someone else. Just can’t remember where, when or who. BTW was that you over at “ClimateRealists”? If it was, you appear to have learned nothing there; we could explain what happened if you have any interest at all in understanding what’s happening in the climate blogosphere. “On the WUWT site the commentators had a wide range of views, some informed, most not informed. This blog allows – encourages – criticism FROM THE INFORMED. WUWT allows inane ‘criticism’ from the hopelessly uninformed, but censors comment from those who are informed but disagree. I know which a[[roach i find more useful. I’ve been banned from WUWT for years. I made the ‘mistake’ of asking Watts when he was going to post his promised followup article explaining why it mattered that the different teams used different baselines, pointing out my own and other people’s explanations of why it did not matter. He responded by not only banning me, but by then going back and removing every comment I had ever made at WUWT, about a year’s worth. I am far from the only person banned from WUWT for the crime of being informed and disagreeing, and explaining why he is wrong. But I do have the honor of being the only person expunged from WUWT. But it’s not a free speech issue. Watts gets to run his blog however he wants. I get to laugh at him for it, and explain why he is a hypocrite for it. Neither I nor you have any shortage of outlets to make our points – neither of us is being censored. The difference between there and here is that Watts encourages the idiots and bans the factually accurate and informed, and Tamino encourages the factually accurate and informed and bans the idiots. That’s very interesting, Lee, seeing as Watts has labeled Skeptical Science an “unreliable blog” for almost exactly the same reasons. There have been several sceptics (sic!) who have described similar experiences at WUWT. The evidence quickly disappears, of course, unless you save webpages yourself or are able to find them on the Wayback Machine. The “free speech” claims about WUWT are simply false. If his handle were “Troll McTrollypants,” and he had a thumbnail self-portrait, which was a troll with “TROLL” tattooed on its forehead, it would be no more obvious what he’s trying to do than it already is. Bomber drop the condescending attitude. Free speech allows to say the most supid things. It is exercised with merry abandon on WUWT. It’s up to you to use your free speech privilege to say stupid things or not. If you do so, most here, who are informed and know better, will tell you how stupid it is and that you’d be better off shutting up. Your free speech still won’t be denied since you can go on spread the stupid somewhere else. Your right to free speech does not include any obligation on my part to have to listen to nonsense. Furthermore, this blog is not the Republic, it does not have to tolerate nonsense for the sake of general societal principles. On the other hand, it will not make any attempt at preventing you from exercising your free speech anywhere else, unlike indivduals like Cuccinelli who really use the power entrusted to them by constituents to make such attempts. Lastly, so many have been banned from WUWT for simply trying to inject some sense in their idiotic ramblings that your insinuations are laughable. If Tamino’s patience could be monetized, he would be filthy rich!! Cudos to him. On the other hand the various septics should not see that as a weakness. His goal is to inform, so from time to time he tries even with the hopeless cases. Well Bill_The_Frog has me thinking about how you normalized the two time series. Did you equate the variance (or standard deviation), then do a zero mean? I would think that a min/max scaling followed by a zero mean would also work. In either case, once normalized, you could remove time, by plotting normalized sun spot one one axis and normalized SST on the other axis (e. g. a scatter plot), then calculate the R^2 from that. 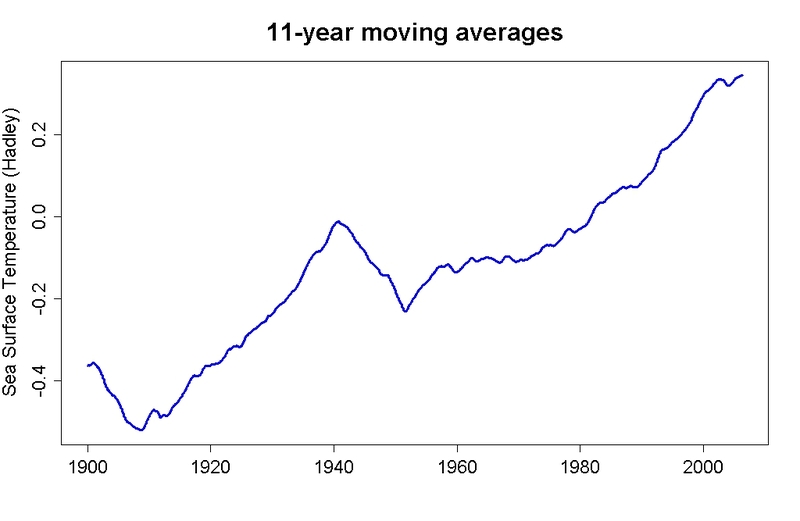 I’d expect a low R^2 regardless of normalization method (11-year moving average would also carry some autocorrelation into the final R^2, better to do 11-year binning (but then we’re down to N = 11)?).. It’s fairly obvious that, just looking at these two time series, sun spot number is a very poor estimator for SST. What are the calculated trends? That first one definitely looks like a positive trend. Even if it isn’t accelerating, I still would give a pass for calling that an increasing trend. If anyone is looking for a little extracurricular activity I have a guy over at Peter Sinclair’s channel trying to defend Goodridge. His basic idea is that Goodridge is “correct” since both the 110 year trend for sunspots and the 110 year trend for SST are both positive. It’s a bit lowbrow for Tamino’s site here but Peter tends to enjoy allowing these guys to post. Sorry, Michel, but there are some comments you’ll need to respond to first, before anyone is willing to pay any further attention to you. Don’t know what you want a reply to. One comment seemed to say that a point I had made was what the IPCC says. I don’t have any comment on that. My comment on that would be I’m fully convinced of the warming effect of a doubling of CO2 to about 1C, and also that it is physics. I am less persuaded of the certainty of the feedback effects which are supposed to amplify this warming to 3C and beyond, and do not think that is in the same category. If you want comments on Ray’s remarks about third grade understandings, I don’t do that sort of thing. I do think that the medical analogy is a proper one. Even if wrong, I think its a point that deserves debate rather than dismissal. Whether the science on climate is settled? Well, some is and some isn’t, its like all of science, I would say particularly like medical science. You get exactly the same arguments in the saturated fats – heart disease area, including invocations of precautionary principles and the arguments about unexpected consequences and the importance of first not doing harm. The move from physics to policy, like the move from metabolic theory to drug or diet prescription for whole populations, is much more complicated than Ray’s comment allows for and involves all kinds of considerations that are not physics at all. Just as the statins issue involves lots of considerations that are not about the science of fat metabolism though they start from there. Are politicians behaving like the launch team on the ill fated shuttle mission? It does not look like it. They have a very difficult choice with a great many uncertainties, not least what they are actually able to get done. The shuttle analogy is not appropriate. In the shuttle case, there was a small team and a binary decision. They could have cancelled or postponed. In the climate case there are many choices, many players, many possible consequences, many different ways to implement, there’s a huge international dimension. They are doing their best, many of them, to grapple with it. One complication, for instance, which is totally absent from the shuttle case, is that its not clear what effect one country’s unilateral actions will have. The UK, interestingly, has signed up for draconian carbon reduction targets which everyone will agree will in themselves have no measurable effect on global temperatures. But the UK political leadership felt it was important to do, and there is growing opposition and they are now back tracking on green energy subsidies. Are they behaving like the shuttle team? No, that is not fair. It is as someone said rather sadly the art of the possible. Your comparison of climate science to medical science is not only incorrect, it is fatuous. It betrays an utter lack of understanding of the situation in climate science. First, among experts, there is no debate. Only 3% of those who publish in climate science dissent from the consensus model. You simply cannot get an Earthlike climate if CO2 sensitivity is as low a 1 degree per doubling. It is difficult even with 2 degrees per doubling. How can water vapor increasing with temperature not give a positive feedback? How can melting icesheets not give a positive feedback? How can you get 33 degrees of warming over the expected radiative temperature of Earth (255 K) without a significant positive feedback? How do you explain the latitudinal, seasonal and diurnal characteristics of the warming without it being due to greenhouse gasses? How do you explain simultaneous cooling of the stratosphere and warming of the troposphere without a greenhouse mechanism. And what is the source of your “skepticism” about CO2 as the cause of warming? You said yourself that it was the policies. This, sir, is a logical fallacy called “Argument From Consequences”. Christ! Not only are your physical objections over a century out of date, your logic doesn’t even match the expertise of Medieval monks! First get the science right–the policy will follow. Your previous comment on another thread is commonly known as the “we don’t know everything so we don’t know anything” argument. The AR4 readily admits that we don’t know everything. They never say the science is settled. They never say that anything is certain to happen. They do spend thousands of pages summarizing and integrating research to quantify the probabilities and the ramifications of different scenarios. In a nutshell: they conclude that given the current state of research there is very likely probability that we are (already) influencing the climate measurably, and that the effect will continue to increase and that the consequences will likely be significantly negative for humankind as a whole. This is a very different conclusion than the one you implied you have come to. Point being: If you expect anyone here to take you seriously, you need to do better than a straw man argument. I’ve read this “article” and there is many, many things wrong. The first and the very basic is that Brown is using same albedo (or emissivity) for both IR and visible spectrum and thus, he is getting base Earth temp wrong (288 K, correct result is 255 K). From there on, any calculation and conclusion is meaningless, since the very basic assumption is wrong. Thanks for this point. I had missed it. I want to add this: It is common misinpretation, that climate scientists hasn’t done the measurements about even so basic things. This has been done as early as in 1824(7), when French mathematition / phyicist Fermat proposed the concept of greenhouse. So don’t think climate science is some modern hype (must admit, this surprised me very much). On the other hand, I really do suggest that you read at least some basic principles of climate science before you decide whom to believe and please, do start in 19th’s century physics. You will be as surprised as I was about the level the climate science have reached nowdays and you will see how much nonsense and low knowledge is in the writings, such as the one you have linked here. Best answer yet–highly specific, if voluminous. Kevin, I’d vote for Patrice’s answer. It is even more specific (even if it was less concise). If michel wants to address it (along with telling us what he thinks is right with the article) he will at least have a starting point. Otherwise he can sit back down. The guy is jumping from thread to thread, trying to avoid dealing with any of the responses to his earlier comment like some kid who is losing at checkers then throws the board up into the air yelling “Start over!” Then after one jump links to trash as his sole argument without actually giving any indication that he read it. Just, “What is wrong with this?” Troll written in eight languages. And this isn’t a game. I appreciate your responding to some of the points in the post at the other blog. Insightful. But to this guy it means nothing, and he deserves less than that. So taking out most of the relevant detail and saying, “Hey, this picture looks absurd!” is not very convincing. Sorry about that vestigial trailing parenthesis! Just try to ignore it; it no longer has a function. Kevevin, thanks to you and to Patrice who were kind enough to reply to my question politely and factually and informatively. To those of you who responded to a sincere question with childish abuse, you are doing your cause no favors. Such behavior neither informs, convinces, nor brings sympathy. Contrary to what some of you have said, I am not arguing, and do not think, that because we do not know everything we know nothing. There are many things in medicine that we do not know, but we know how to treat appendicitis. We know how to treat some forms of heart disease. All the same, the picture regarding diet, cholesterol and statins contains large areas of unkown, enough to require great caution in public policy. Even when we know much, there may be areas of uncertainty, and these may be important for public policy. You all evidently differ from me, but I think in substantial areas of public policy regarding climate we are in this situation. [Response: We also know that cigarette smoking causes lung cancer. We don’t know the precise mechanism by which this happens, we don’t know how to treat it in many cases, in fact the uncertainties are staggering. BUT WE KNOW IT HAPPENS and we KNOW that it’s deadly. Contrary to Mr Ladbury’s invective filled reply, I am not skeptical about the warming effect of CO2. I have no idea what he means by the assertion that I said it was about the policies. I remain of the view that the effects of feedback are separate from and less certain than and require verification and proof by different considerations than those of the warming effect of a doubling of CO2. That is not trolling, that is informed sincere opinion, and I cannot see why it should be made the occasion of a chorus of abuse. Hmm, Invective, eh? Methinks someone is unsure on their definitions. Care to show me where I was abusive? Violent? Or shall we add rhetoric and the English language to climate science, scientific method and logic on the list of things about which you are clueless. I merely pointed out that when it comes to climate science–and evidently science in general–you are an utter ignoramus. Ignorance is curable. Mine was a diagnosis, not abuse. Unfortunately, willful ignorance is a much more pernicious problem, and you seem to have a particularly bad case of it–as indicated by the fact that you still insist on equating the state of climate science with that of medicine. This is not only wrong, but risibly so. The science of Earth’s climate is quite mature. There is a well developed and generally accepted theory with an impressive lineup of verified predictions under its belt. There are things we don’t know, but as we learn more, the effect has been to leave the expected value about the same and tighten the uncertainties–e.g. the expected CO2 sensitivity remained 3 degrees per doubling, while the 90% confidence interval tightened from 1.5-6 to 2-4.5. This is what we expect from a mature science. In marked contrast, there are no models in medicine by which we can fully understand, say, your example of which statins will work in which patients. Medical trials and indeed much of medical research are largely epidemiological, with little or no theoretical guidance. This is only just barely science. And yet, despite your comparison having been shot full of more holes than a speed limit sign on a rural highway, you insist on ressurrecting its decaying corpse and letting it wander around saying “Brains! Brains!” To date, you’ve shown no evidence your learning curve has a positive slope. And now I think I see why: The truth matters less to you than whether we are “nice”. You’ll avoid that mean old crossing guard and jump into the van of the man who offers you candy. That usually doesn’t end well. No, I am not nice. However, I am one of the most helpfuland persistent instructors you will find when people ask sincere questions. No I don’t suffer fools gladly. Don’t like that? Quit being a fool and start remedying your ignorance. As Tamino says, the future of human civilization is at stake, and folks like you are willing to bet it on a worse than 20:1 longshot. Oh, uh, and for the record: That was abusive. To those of you who responded to a sincere question with childish abuse, you are doing your cause no favors. Dude, the earth orbits the sun, not Michel. Meh, cut him some slack dhogaza. He’s run the gauntlet now, stood against the dragon breath, and come back to post again (albeit on another thread, but who knows what passes the powers that be?). Michel – Speaking for myself – You pushed a button when you used “hypothesis” early in your first post. IMO the choice of “hypothesis” or “theory” is subjective depending upon one’s persuasion. No one here is interesting in disputing your choice of words (unwinnable, pedantic) but it set up how I (we?) perceived you. I hope you stick around for awhile. Who knows; we may all learn something. Peace to all in the New Year. The brave editor is Sonja Boemer-Christiansen and she is the editor of ‘Energy and Environment’. A much pilloried journal which desrves our support and uplift for the sterling work it has done to keep the flame burning all these years in the face of vicious opposition. Even before this nonsense is written up the only hope for it ever getting published is in E & E. This just shows that it is not rigorous science and that the deniers know this but will push it out anyway. Apart from the ideological positions underlying such remarks from TB and friends, this stuff betrays an alarming ignorance of academic life generally. It’s not just science. Have a look at philosophy or history or other journals and you can see the same kinds of robust, vigorous, argumentative, scornful, dismissive, contentious words exchanged at 40 paces at dawn. I often get the impression that these people were inculcated with primary school notions of remote figures in ivory towers. Maybe too many films with Oxford dons conducting tutorials and vivas in cluttered studies over glasses of sherry? The idea that the non-film academic lives of such characters included decades long disputations over philology or Egyptology or optics or any other topic you can name along with dangerous, if not incredibly foolhardy, expeditions to remote corners of the world seems entirely absent. And they seem oblivious to the idea that modern oceanographers, ecologists, glaciologists and the like are the (better equipped) Douglas Mawson and David Livingstone characters of the modern world. Yes, the idea of scientists as dispassionate nerds is one of the most perincious myths we face. Indeed it is precisely because of passion–the passion to discover the truth–that science works at all. It is not about passively staring through a microscope and recording what you see. It is about observations that are nearly incomprehensible, and struggling in the dark to understand them. And then the dawn breaks and everything fits together, and goddammit you are not going to let go of that truth unless someone else comes along with one that shines even brighter and provides even more understanding. Because moving toward the light, cleaving to the light is the only way to shine light over ever more of the terrain that was once obscure. Roy Spencer did the this will not be published because they are scared of my argument thing at AGU in an INVITED talk. Yes Roy. As to Tallbloke and the next Einstein, Eli had a few thoughts”. michel: I am less persuaded of the certainty of the feedback effects which are supposed to amplify this warming to 3C and beyond, and do not think that is in the same category. Luckily, the ‘flame of truth’ is reputedly carbon-neutral. . .
Ah, BPL, look at the first page of Google hits and there’s SPPI on that suggested search question, answering science questions to the public.